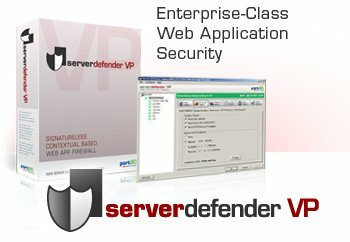 ServerDefender VP is a host-based Web application firewall designed to protect against common threats like SQL injection and XSS, as well as new, unknown, zero day threats. With intuitive controls, ServerDefender VP allows users to quickly and easily change security policy settings with a few clicks. The interactive LogViewer provides detailed insight into threat logs and allows users to investigate, create exceptions, and respond to incidents by blocking offending user IP addresses. Unlike most other Web application firewalls, ServerDefender VP doesn't use lists of attack signatures to match and stop threats. Instead, it uses a rules-based system with a combination of white and black lists to provide advanced security against well known threats as well as new -unknown - threats. Custom pre-installed security profiles for SharePoint, .NetNuke, Outlook Web Access (OWA), WordPress, and Joomla make it easy to get started quickly. Secure: Provides powerful security against top persistent threats like SQL injection and XSS. Session aware security, tracks users' sessions to score any suspicious or threatening behavior - and block when necessary. Monitor: Interactive Log Viewer provides data on hack attempts in real-times. ServerDefender VP also sends comprehensive daily reports of trends and security events right to your email. Alert: You can't always be watching, so SDVP sends alerts via email when hack attempts occur. Reduce incident response time by temporarily blocking the offending IP right from the email.